BIG NEWS! Now that I have thoroughly revised and updated my “PEYTONs Along the Aquia” book, I am posting all of my comments and corrections to it at a dedicated site: PEYTONs Along the Aquia – Second Edition. Please visit. 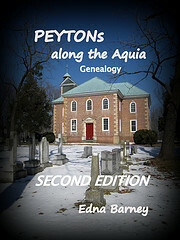 The “Second Edition” of “PEYTON’s Along the Aquia Genealogy” is now available as of May 2009. It contains all the the corrections to the 2004 Edition that I have cited here, plus much more additonal information resulting from the research I have done since the First Edition was published in 2004. The genealogy book is available in both hardcover and paperback – PEYTONs Along the Aquia – Second Edition. COMMENTS ARE CLOSED here. Please visit and comment at PEYTONs Along the Aquia – Second Edition. I am a direct descendant of John French of Westmoreland County. He was married to Martha Upshur who married Capt. Michael Cresap after John’s death. Do you have any information on this line? If you do, I would be interested in purchasing your book. P.S. I am an avid genealogist. I do not know anything of John FRENCH of Westmoreland. Daniel FRENCH and his family and their connections with the PEYTON family are in my book. Does your John FRENCH connect to the PEYTON family? Doris – I did not find anything on Charles PEYTON born 1702, in my book. A man born at that date would be too old to have been a soldier in the Revolution, so that must be another Charles who got the 100 acres bounty land. James PEYTON who died in Nelson County, Kentucky along with his son Daniel PEYTON are in my book. 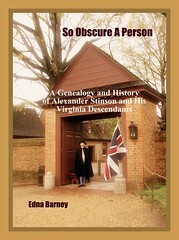 Hello, I am wondering if there is a connection between the Peytons of Stafford Co. VA and my Herod line. My Rev soldier William Herod was son of John and Mary Herod of Stafford Co. – he supposedly married a Valentine but I can find no Valentines in Stafford Co. William Herod moved to Spotsylvania Co. VA in 1792 and then to Smith Co. TN in 1808 where he settled along Peyton’s Creek. I have found a reference to Herod’s Ordinary in the Virginia Gazette dated 18 Jan 1770. It was six miles north of Falmouth. The book They Called Stafford Home states Peyton’s Ordinary in 1769 was one of two licensed in the county – could Herod’s be the other one or were they one and the same? Is there any way Valentine Peyton was related or descended from someone with maiden name Valentine? I found a reference in the book They Called Stafford Home to a Valentine tract purchased by William Robertson in the Aquia Creek area. Was this the Valentine Peyton tract or an actual tract of someone named Valentine??? I cannot help you with the Herod family nor the Valentine family as I have not found any connection of those surnames to the Peyton family. I do not know the name of the other Ordinary in Stafford County. Yelverton Peyton ran his tavern until early 1780s, and his wife kept it going after his death. I don’t know about a Valentine tract, but Aquia Creek is where the Peytons owned land. Was the Yelverton Peyton who ran an ordinary near Aquia the same Yelverton Peyton who came to Kentucky in 1779-1780 and settled in Boonesboro? Also, William Wells (c. 1770-1812) who died at the Fort Dearborn Massacre, and whose family lived (c. 1700-1767) near Dumfries, named one of his son Yelverton Peyton Wells. Does anyone know why? Thank you for any information. Was the Yelverton Peyton who ran an ordinary near Aquia in the 1760s the same man who came to Kentucky in 1779 and settled at Boonesboro? If not, who was this Yelverton Peyton? The two Yelverton Peytons you mentioned were not the same person. There were a number of that name in the Peyton family all the way back to England. I don’t recognize William Wells of Dumfries, but assume that he named his son for one of the Virginia Yelverton Peytons, probably the one who lived at Aquia which is near to Dumfries. The Yelverton Peyton connected to the Ordinary is on pages 79-81 and the Yelverton who went to Kentucky is on pages 137-139 of Peytons Along the Aquia.